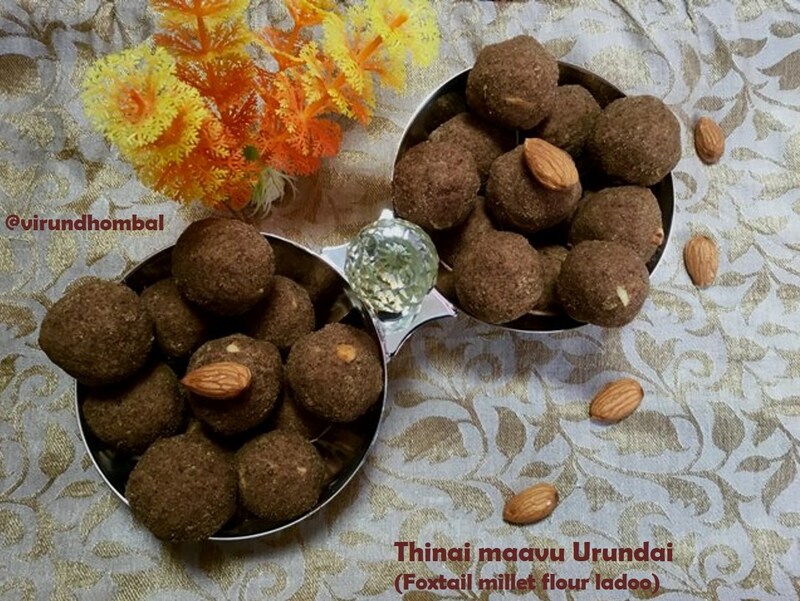 Foxtail millet flour ladoo - millet based desserts are easy to prepare and loaded with health benefits. These ladoos give energy to the body for a longer time. Considering the fact that the packed dessert contains excess sugar in them to preserve for a long time, we must try to reduce the packed food items. Hence, preparing homemade dessert with few available ingredients gives you a healthy dish and also economical one. Today we are going to see how to prepare this ladoo with healthy ingredients like foxtail millet flour, moong dal flour, cane sugar, ghee and nuts. To give a smooth texture to the ladoos I have added moong dal flour. When I prepared this ladoo with foxtail millet flour, nobody showed much interest, but when I added the moong dal flour it was a big hit and my son enjoyed it very much for his evening snack. It's very hard to grind foxtail millets to smooth powder at home, so I have used store bought foxtail millet flour. 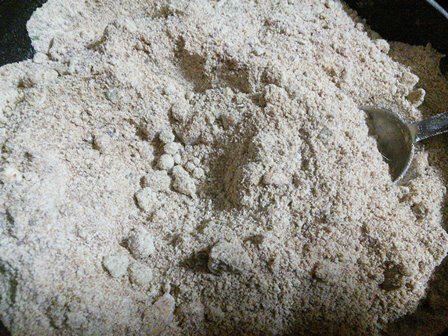 If you want to prepare the homemade foxtail millet flour, roast the foxtail millet for a few minutes in a dry pan and powder it finely. 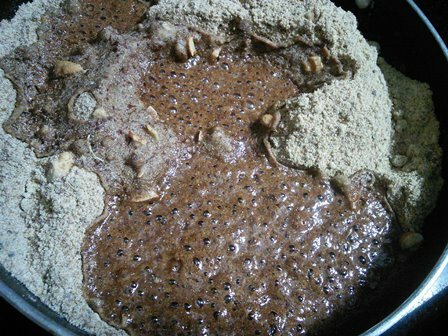 Sieve the flour for 2 to 3 times to get a smooth flour for ladoos. 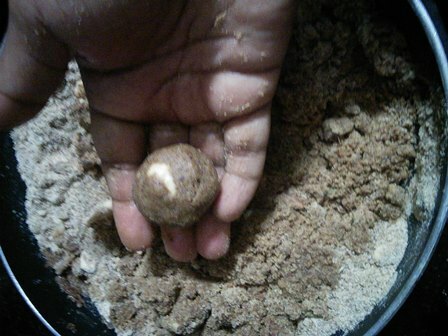 Same technique applies for powdering the moong dal flour. If you find it difficult to prepare moong dal flour, you can simply powder the fried grams also. 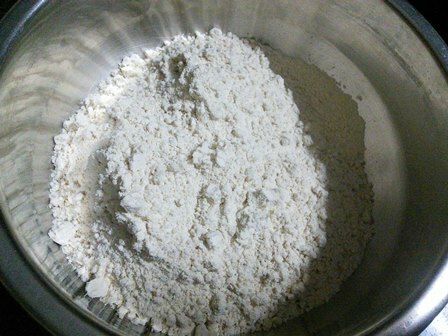 Once the flour is prepared, both the flours are mixed well. To add sweetness, I have added powdered cane sugar. You can also use white sugar or powdered jaggery too. Now let's see the recipe in detail. Millet based desserts are easy to prepare and loaded with health benefits. 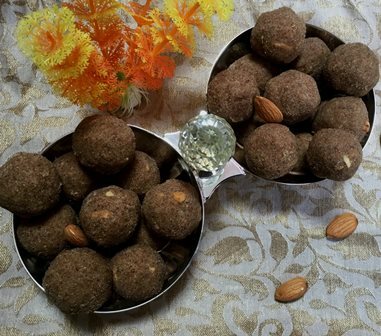 These ladoos give energy to the body for a longer time. Take a wide mixing bowl and add the foxtail millet flour and moong dal flour. Mix them well with a dry spoon. 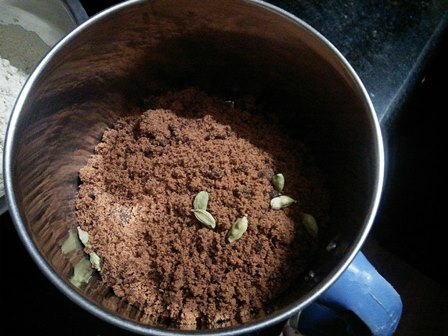 Take a big mixer jar and add the naatu sarkkarai, cardamom and a pinch of edible camphor. 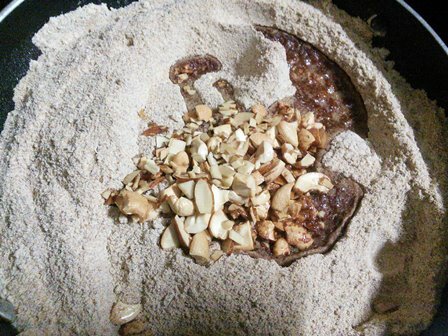 Transfer the ground naatu sarkkarai to the mixed flour and knead the flour gently. 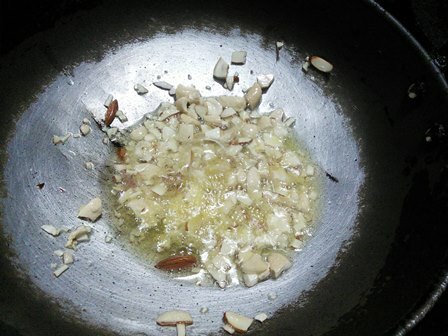 Heat a tbsp of ghee in a pan and the chopped nuts. Fry them until golden brown and add it to the flour. Mix them well. 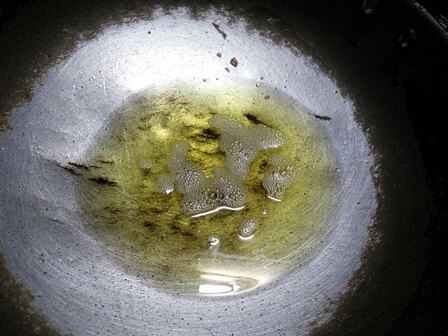 Melt the ghee in a frying pan. When the ghee has started to smoke, turn off the heat. Slowly add the melted ghee to the mixed flour and stir them gently with a spoon or ladle. When it is warm enough to handle, start shaping the ladoos. Rolling with your palm for 3 minutes to shape the ladoos. Continue the process for the entire flour. Take a wide mixing bowl and add 2 cups foxtail millet flour and 1 cup moong dal flour. (Don't forget to measure before adding the flours). Mix them well with a dry spoon. Take a big mixer jar and add the naatu sarkkarai, cardamom and a pinch of edible camphor. Whip it for 2 to 4 times. Heat a tbsp of ghee in a pan and the chopped nuts. Fry them until golden brown and add it to the flour. Mix them well. Melt the ghee in a frying pan. When the ghee has started to smoke turn off the heat. Slowly add the melted ghee to the mixed flour and stir them gently with a spoon or ladle. When it is warm enough to handle, start shaping the ladoos. 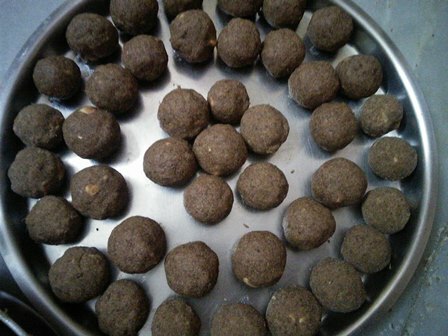 Foxtail millet flour can be difficult to work with it because at first it looks too dry when preparing ladoos. If you add more ghee, the dough will be sticking to your palms and it makes difficult to prepare ladoos. So be careful when adding the ghee. Rolling with your palm for 3 minutes to shape the ladoos. Continue the process for the entire flour. Transfer the ladoos to an airtight container. This ladoo stays good at room temperature for 1 month. I hope you will try this easy and healthy ladoos for your kids and family. If you try this recipe for Foxtail millet flour ladoos send us your feedbacks.